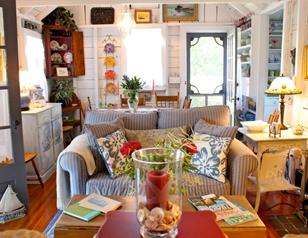 Pet-friendly cottages within a two-minute walk to the beach. Three unique locations to choose from for couples or large families. Free wireless internet, DVDs, board games and HDTVs for that rainy day. Take one of our bikes for a ride, kayak in the Atlantic Ocean or walk the sandy shore. If you are looking for a pet-friendly summer cottage rental in Rockport MA, Rockport Cottages has the accommodations you need. From shopping and dining to views of the Atlantic Ocean in all its grandeur, the Cottages at Rockport give you and your family access to the best that New England has to offer. Each of the cottages was built by local fishermen, and their descendants are still working hard to provide guests with a relaxing and luxurious place to spend an unforgettable vacation. There are three options to choose from when staying at the Cottages at Rockport, and each has its own unique charm. The Cottage on the Pond is nestled at the end of a secluded lane, and guests can enjoy relaxing views of the mill pond from the hammock in the back yard. With its antique style and warm atmosphere, the Sound House is every bit as cozy as it looks. This antique cottage was recently renovated, allowing you to experience old-fashioned living without sacrificing modern conveniences. The Cottage on the Lane has three upstairs bedrooms with views of the ocean, and the downstairs living area is perfect for family gatherings. Feel free to bring dogs and other furry friends as pets are always welcome. When you stay in a cottage rental in Rockport MA, you will have endless recreational opportunities to choose from. No matter what time of year you visit the Cottages, the town of Rockport is full of fun things to do. In the wintertime, ice sculptures and carolers make the streets come alive with the holiday spirit. When the weather is warmer, the festivals and celebrations in the area are as vibrant as New England's blossoming vegetation. The beach is just a two-minute walk away from the cottages, and you can also use our bikes to travel around the island of Cape Ann. If you would like more information on renting one of our cottages in Rockport, contact us at (978) 290-4022.